The Minister of State for Youth Affairs and Sports (I/C) and Information & Broadcasting, Col. Rajyavardhan Singh Rathore with the Minister of Youth and Sports Republic of Serbia, Mr. Vanja Udovicic, at World Youth Forum, Sharam El Shiekh, Egypt on November 05, 2017. 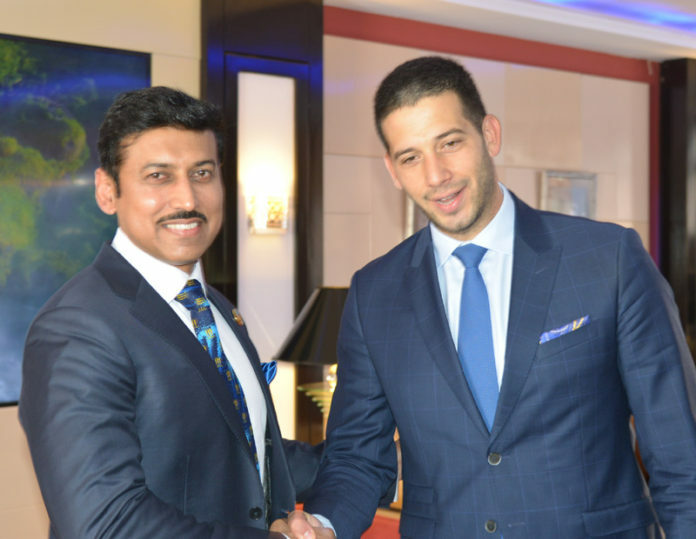 Sharam El Sheikh: The Minister of State (Independent Charge) for Youth Affairs and Sports, and Minister of State for Information & Broadcasting, Col Rajyavardhan Rathore met his Egyptian counterpart Mr Khaled Abd El Aziz on the sidelines of World Youth Forum at Sharam El Sheikh, Egypt today. Col Rajyavardhan Rathore is attending World Youth Forum on behalf of the Prime Minister Shri Narendra Modi. 52 countries are participating in the Forum. Four youngsters sponsored by the Department of Youth from India are also participating forming the part of strong Indian presence at the Forum. President Abdel-Fatteh Al Sisi will inaugurate the Forum later today.